Gorgeous Lemon Quartz frame prismatic cushion cut Citrines in a halo and dangle like lockets exquisitely from Diamond lined hoops. Crafted in glamorous 18 Karat white gold, the color combination is majestic. 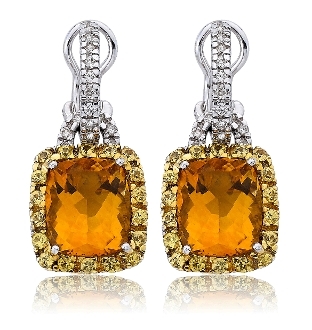 These fine Diamond earrings boast 0.40 carats total weight Diamonds, 10mm by 12.1mm Citrines, and a total of 38 Round Lemon Quartz. These post style hoops secure with french back clips, and the locket style Citrines can also be removed to wear the Diamond teardrop hoops alone.